This large white Pig model is perfect for decorating yourself at home or to have in the garden, this resin statue looks fantastic with her sitting Piggy friend (JR 0200505PB) in any farm-yard setting. This Pig is gorgeous; a real must for all Pig fans! 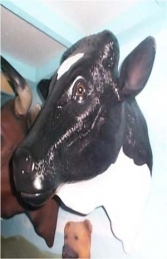 She is very life-like and would look fantastic in any farmyard themed area or in shops, businesses, pubs, restaurants, coffee shops, adventure golf courses, zoos, theme-parks or would even in your own home or garden. It is finished in primer so you can decorate it as you like.